This alternate password reminder system sends the member a fully branded email that includes their existing password. The email is tracked in ONTRAPORT, and you can see when it has been opened in the Contact Log. This method is easier to use for audiences with less technical backgrounds, and is appropriate in cases where higher security is not required. An example is a site for music lessons where the login is simply to control access to protected course material. You would not use this process for a site that contains any personally identifiable private information, such as repositories of contracts, sites where medical information is discussed in a forum, etc. This alternative to the default "lost password" function in WordPress will send a custom password reminder email from your ONTRAPORT account, complete with all of your branding. 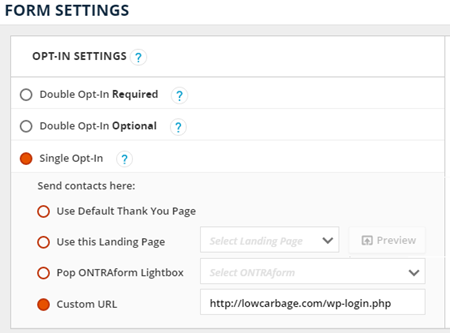 It requires you to create a new login page on your WordPress site first. Then follow the instructions below for each membership website you have. Set the Send Contacts here: to Custom URL and enter the URL to your custom login page. 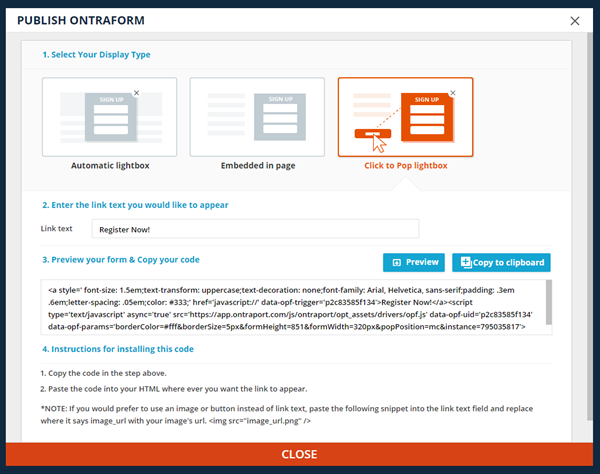 Save the Form Settings at the bottom of this dialog (do not use the Manage Form Fills section as all other actions will be done on the Campaign). Select the Click to Pop Lightbox option and edit the link text to say Forgot Password? Select "Contact Submits a Form" for the Trigger. Use the dropdown to select the Smart Form you created for the website. For Who can activate this trigger? select "Any Contact in account". In the If Contact is already on map, then ... drop down select "Add here again when triggered" (this setting leaves them where ever else they are on the Campaign Map; this is important if you are adding this password reminder path to an existing Campaign). Leave the checkbox unchecked for This trigger can only be activated once per Contact. Add a Condition element under the Trigger. 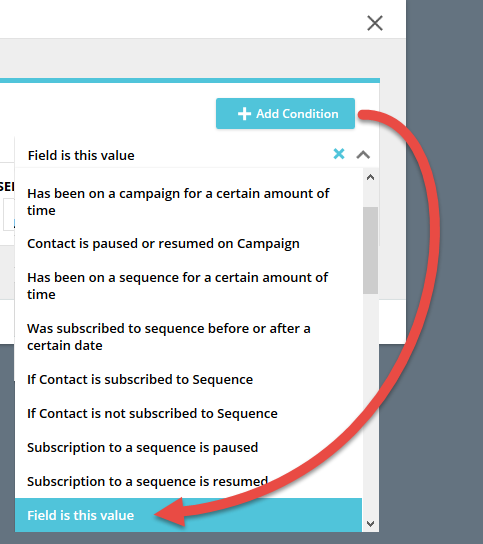 Click +Add Condition and select "Field is this value"
In the Select Field drop down drill down into Website Subscribers >> <SiteName> and select the Status field. In the Select Condition drop down select "Not Equal To". Leave the Select Value drop down blank, indicating that the Status field must not be blank to proceed down the yes path of this condition. Add a Send an Email element under the "Yes" path of the Condition. Create the email message to send the current password. 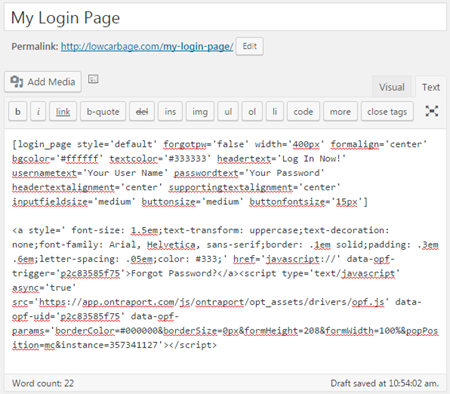 Use the merge field for the site's Password and compose the text of the email. Optional: Insert the merge field for the site's Username and hyperlink the URL where members can log in. This is less secure than sending only the password, as anyone intercepting the email then knows the exact URL and full log in details. Click Settings and enter subject line, send from, and reply to details, and compose the entire email. Click the "Copy from HTML" button to create a plain text version of the email. You will be returned to the Campaign map. Add an End element under the email element. Do not check the Remove Contacts from this Campaign when they reach here checkbox. Add an email element under the No path of the Condition and create a new email for "No status"
Compose your email to tell the user that they are not a member of the website, and cannot receive a password. If you have a paid membership site you can include a link to the sales page for the site. Note: If you have a free membership site you can alternately use a "Give WP Membership Access" element in the No path and add an Email element under it to send the new user their login credentials. Add an End element under the last element in the No path of the Condition. Do not check the Remove Contacts from this Campaign when they reach here checkbox. 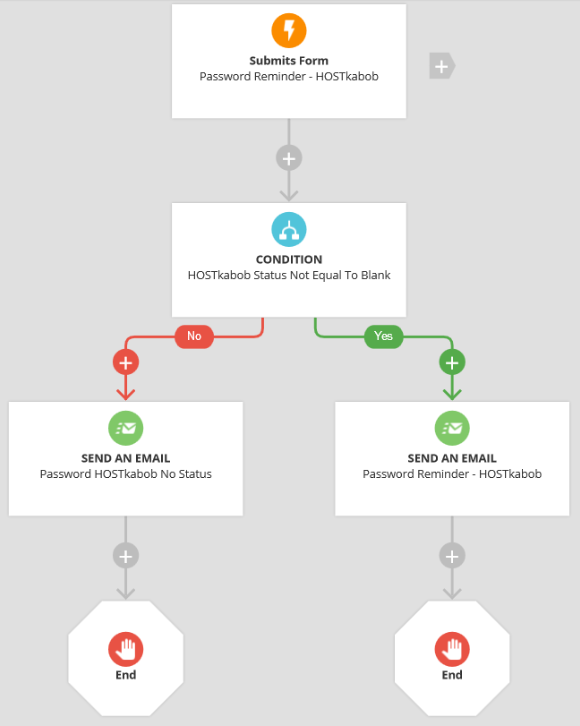 The complete lost password campaign path for this membership site looks like the image below. Repeat these steps starting from step 3 for each additional membership website. Now when your client clicks the Forgot Password? link the ONTRAform will pop up. The Contact fills in their email address and is subscribed to the Password Reminder Campaign. The Trigger on the Campaign is set to always add the Contact to this campaign path, even if they are already on the map elsewhere; this allows you to add this campaign path to your Membership Campaign map. The Condition checks to see if they really are a member, and allows you to tailor your response to them.